Robert Post misses his phone line. Post, 85, has a pacemaker that needs to be checked once a month by phone. But the copper wiring that once connected his home to the rest of the world is gone, and the phone company refuses to restore it. In October 2012, Superstorm Sandy pushed the sea over Post’s neighborhood in Mantoloking, N.J., leaving hundreds of homes wrecked, and one floating in the bay. The homes on this sandy spit of land along the Jersey Shore are being rebuilt, but Verizon doesn’t want to replace washed-away lines and waterlogged underground cables. Phone lines are outdated, the company said. 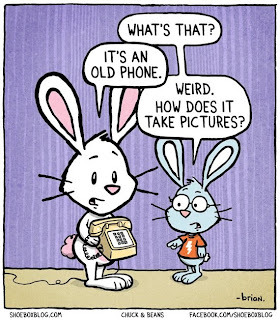 With the advent of cell phones, Skype and other internet communications I can understand this change. Even so, for this onetime Ma Bell employee, I will miss the simplicity that the copper lines brought us. With copper you did not need the power to be operational to make a call. With copper all you needed was a few wires and a handset. Alas, a time gone by. Goodbye copper. You served us well for over a century. Technology just amazes me. I love your Babu gif in the corner there. I needed a chuckle this morning.